These are great Rifle and Pistol ranges. There are deer, elk, bighorn sheep, a chicken, and a wild boar silhouettes to practice your skills on. Do not use 50 caliber weapons on these targets at either range. The Pistol and Rifle Ranges are covered shooting areas. Stationary back stop at 25, 50, 100, and 200 yards for the rifle range. The yardage for the pistol range can be varied with our movable back stops. The pistol range also has 2 racks with 6 lay down steel plates. Always follow the club safety rules for caliber and distance when shooting our metal targets. One of the fastest growing shooting sports. 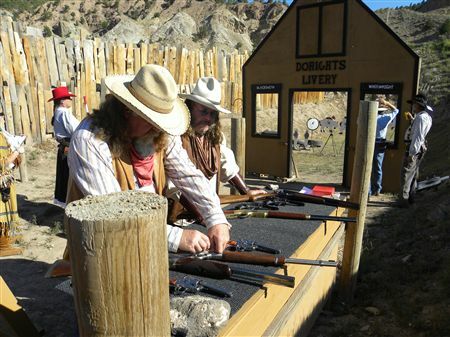 Cowboys and Cowgirls use replica guns of the old west and also dress the part to create an enjoyable and challenging shooting sport and competition.Cowboy Action at its best. Check the Event Calendar for scheduled shootingcompetition. Come watch the shoot or join in, all new shooters welcome. www.sassnet.com Click here to access Single Action Shooting Society.